Save on operating costs with energy efficient DC motors--up to 65% more efficient than traditional AC fan motors. The Big Air 96 in. ceiling fan is a modern industrial ceiling fan with a unique look that is functional in both indoor locations such as a living area or warehouse and tough enough for operation in wet locations when installed in a GFCI protected branch circuit. The large corrosion-resistant blades deliver a cooling circulation and can be used in both summer and winter to help cool any area more efficiently. 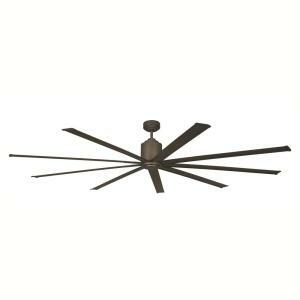 Tbook.com crawls the web to find the best prices and availability on Industrial Hardware and related Tools and Hardware products like Big Air 96 inch Indoor/Outdoor Oil-Rubbed Bronze Industrial Ceiling Fan. For this page, related items include products we find that match the following keywords: "Industrial" at our vendor partner Home Depot. Big Air 96 inch Indoor/Outdoor Oil-Rubbed Bronze Industrial Ceiling Fan is one of 143 Industrial Hardware and related products listed in the Tools and Hardware section of Tbook.com If you have any questions on this product, please give us a call at 734-971-1210 during the hours of 9am - 5pm EST for assistance. Thank you for shopping at Tbook.com, the Internet Department Store!